Oh Lord make it possible to complete this successfully. Praise be to the Lord of the Two Worlds and may the end of the Believers be prosperous and prayers and blessings on his messenger Mohammad and his family and all his followers. 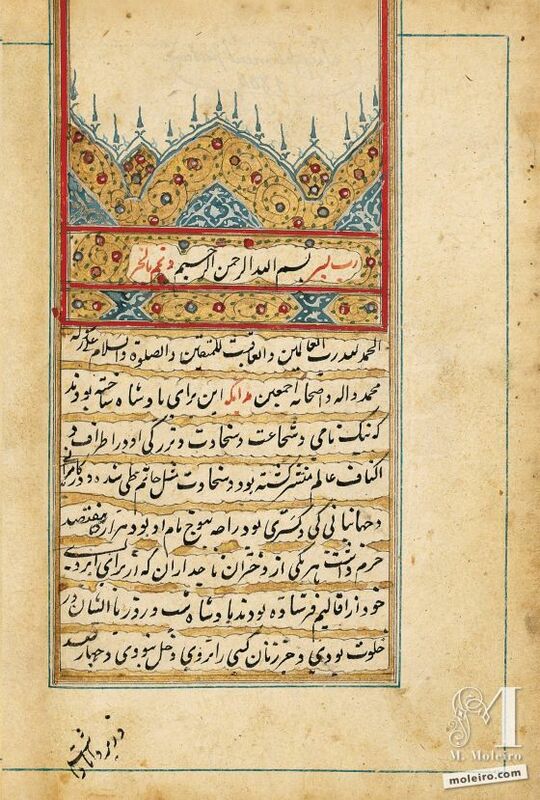 Know that this was written for the King whose good name, courage, generosity and greatness was known all over the world; in generosity he was like Hâtim Tai and in governance and benevolence he was like Key Khosrow and Khosrow Anushirvân. His name was Rajah Nabutaj. He had 1,700 women in his harem. Each one was a daughter of a king who had been sent from all climes in recognition of his fame. Day and night, the King was in seclusion with them. Nobody but women could enter his privacy. He had 400 wise viziers. Each one was sagacious, competent and knowledgeable like Bozorgmehr. The management of the country was their affair. One of the viziers was particularly special; he always engaged in philosophy and was exceptional in gathering wealth. The King had given him five crore rupees and had sent him to the king of Sarandib-e Surt. This vizier’s name was Koka Pandit.